The Award is open to any students (higher education) in Europe: Bachelor, Masters, MBA, PhD, non-european exchange student, etc. You can participate alone, or work in pairs. Teams can be made of students from the same institution, or from institutions miles apart, even in different countries. To find a team-mate, you can contact USAIRE (student-award@usaire.org) before the May 1st 2019. 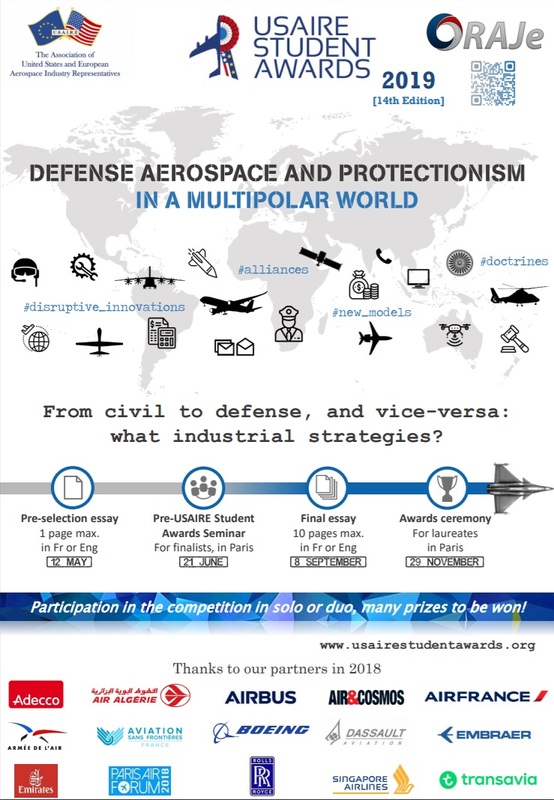 Electronic devices (Panasonic Avionics), a annual subscription to Air & Cosmos..
Acquire and develop essential skills for your career: join ORAJe - The organization of aerospace meetings with European youth, which aims at intensifying and sustaining the relationship between industry and youth. Our partners are the support and bedrock for the USAIRE Student Award. Without them, we would have no participant engagement nor any sources of support and advice to make this campaign successful. We are proud to display our partner companies and industrials below.